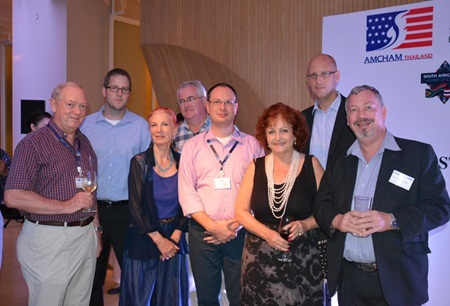 The American Chamber of Commerce was the organizing host for the Joint Chambers networking evening last Friday held at the Hilton in their Drift Bar area, with Executive Director Judy Benn being omnipresent. With David Nardone, President of Hemaraj Land and Development organizing the food, the chamber members were treated to one of the best finger food displays at any Joint Chambers networking. Not only carvery items, but even Peking Duck rolls and other live cooking stations with BBQ seafood and even ribs on offer. Well done, David, and the Hilton, under the watchful eye of Rudolf Troestler, the Hilton GM. 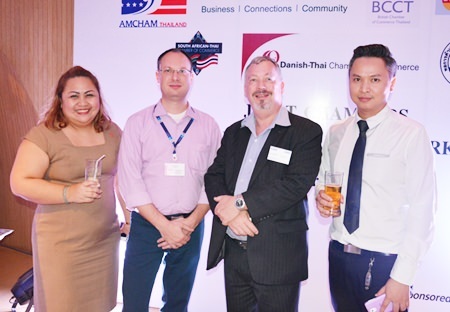 In addition to the usual turn out of AmCham, the British Chamber of Commerce (BCCT), the South African Chamber (SATCC) and the German Chamber (GTCC), the gathering also included newcomers to the joint networking scene in the Danish Chamber and the Belgian Chamber. In the absence of the Danish Thai Chamber president, Danish Consul Stig Vagt-Andersen flew the Danish flag with pride. 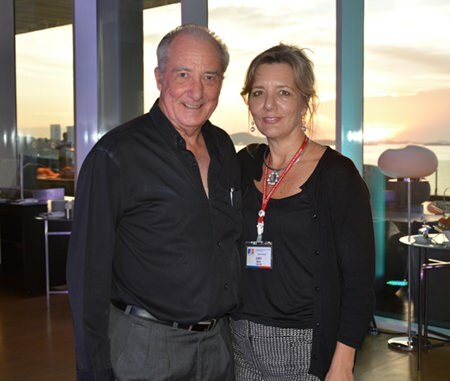 Alain Deurwaerder, Vice President of the Belgian-Luxembourg/Thai Chamber of Commerce was also enjoying the evening for his chamber. 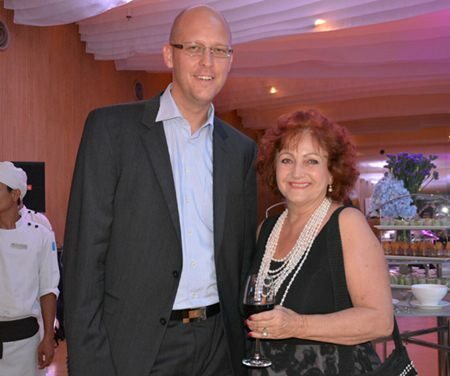 A lovely pair, Dr. Iain Corness and Judy Benn, Executive Director of AmCham. The Chairman of the BCCT, Simon Matthews of Manpower, was present and had another of his luridly patterned shirts covered in flowers – just where does he find these? Another strong gathering was the Automotive Focus Group (AFG) with President Frank Holzer, ex-president Mike Diamente, Richard Jackson and Armin Walter obviously enjoying themselves. 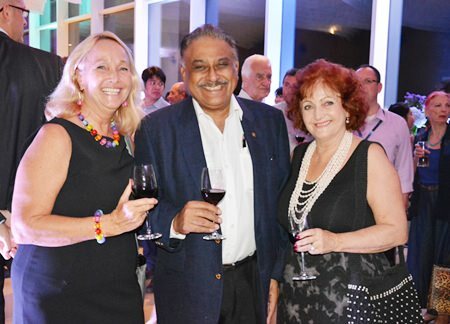 Once again, the networking included many lovely ladies with business cards at the ready with Nancy Ratanaliam and Suree Bunpluk (Bangkok Hospital Pattaya), Eve Namkhammee (Hilton) and I just wish my name was Adam, Suvanee and Thundra (Hemaraj) and Wannaphot Kaewpoung (Ruwac), Christine Zauner (with husband Klaus, head of operations at SIG Combibloc), Rosanne Diamente (Women With a Mission), and many more whose names I did not manage to record. 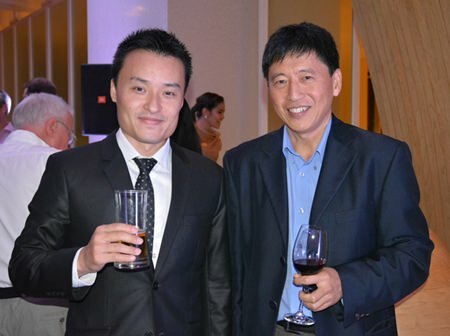 (L to R) Shutaro Tahara from JAC Recruitment Chonburi office chats to Lim Cheng from Chevron. 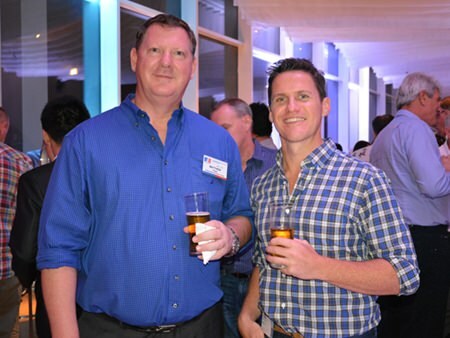 Two big Aussies were Scott Finsten (Ocean Marina Harbormaster) and Matt Fryar (Director of Operations Marriott Resort), seen chatting with many members around the room, in the normal gregarious Aussie way. A newcomer was Dennis Rose (MD at AAM) who has the Eureka Heat Recovery process allowing for unlimited supply of hot water. 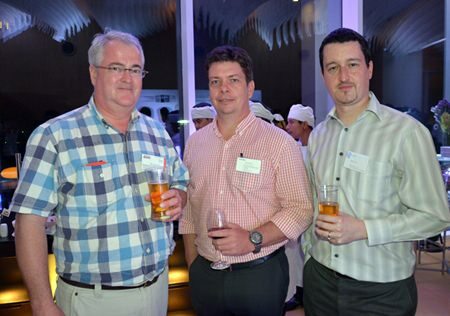 Pattaya Marriot’s Matthey Fryar (left) with Sam McMahon VP Commercial & Finance Thailand of NS Bluescope (Thailand). Other regulars included Ron Grigaras and his ex-boss Craig Donnelly, and Paul McConnell (Deputy Head Secondary Regents International School) who did not wear his kilt in shame following the No vote in the Scottish referendum, Paul Wilkinson (Cooper International Engineering and Services) and Clive Butcher (Highfield). It had been a very successful networking, and the fact that I could not find my car in the dreadfully confusing car park, stands witness to the fact that I enjoyed it too. Michael Diamente (center) and David R. Nardone poses for a photo with Hilton Hotel waitress Lilly (thumbs up). (L to R) Hans Werner Vogt, Tobias Wimmer, Doris Berger-Peters, Okko Sprey, Michael Berger, Elfi Seitz, Rudolf Tröstler and Ruairidh Watters. 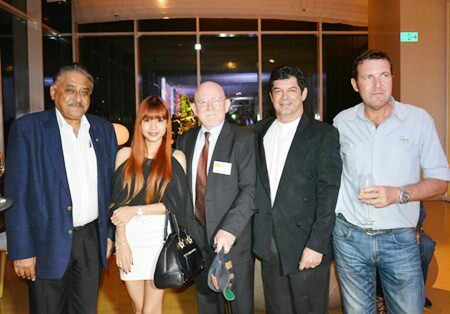 (L to R) Peter Malhotra, MD of the Pattaya Mail Media Group, Wannaphot Kaewpoung, Marketing Executive of Ruwac Asia Limited, Ron Smith, Director of S-3 Services, Bobby Brooks and Paul Gerard Wilkinson, International Operations Manager of Cooper International Engineering & Services Co., Ltd. (CIES). 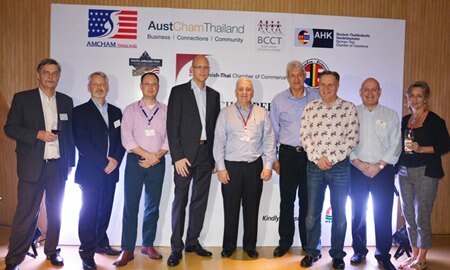 (L to R) Group photo of the directors, representatives of chambers and sponsors of the night, Stig Vagt-Andersen, Consul of the Danish Consulate, Alain Deurwaerder, VP of the Belgian-Luxembourg/Thai Chamber of Commerce, Michael Berger, GM Intergest Thailand, Rudolf Tröstler, GM of Hilton Pattaya, David R. Nardone, President & CEO of Hemraj Land and Development, Leigh Scott Kemmis, President of the AustCham, Simon Matthews, Chairman of the BCCT, Graham Macdonald, President of the SATCC and Judy Benn, Executive Director of AmCham. 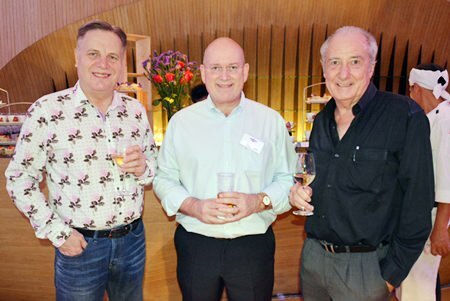 (L to R) Simon Matthews, Chairman of BCCT, Graham Macdonald, President SATCC and Dr. Iain Corness. 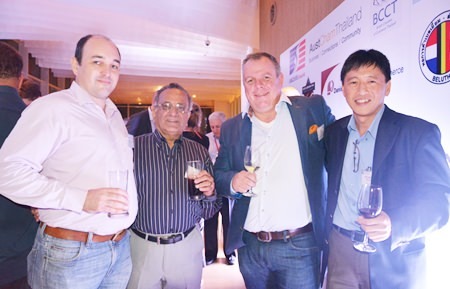 (L to R) Stefan Langhein, Sudhir Khanna, Mark Huisman and Lim Cheng seen having a great time. 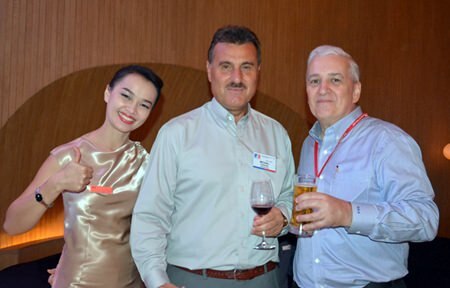 (L to R) Pichaya Nitikarn, PR Manager of the Amari Pattaya, Michael Berger, GM of Intergest Thailand, Ruairidh Watters and Kamolphop Suksamarn, Sales Manager of Nova Platinum Hotel. 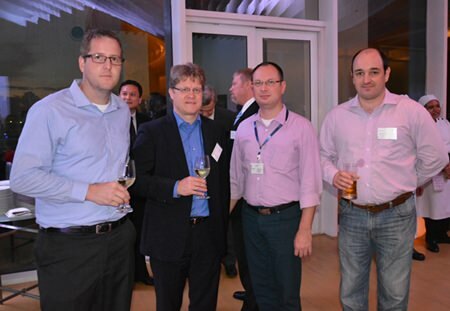 (L to R) Okko Sprey from Plus Exploration, Chris Van Der Merwe from Futuris Thailand and Damien Kerneis, from Geodis Wilson Thailand on their second glass of drinks. 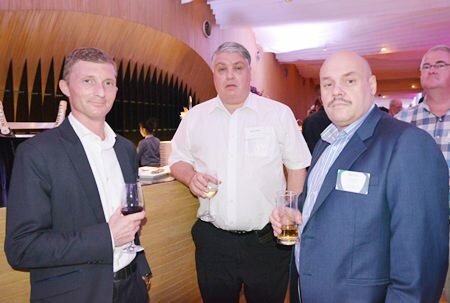 (L to R) Jesper Kjaerskov Pedersen from G4S Secure Solutions (Thailand) Limited, Mike Walls from Oncam Grandeye and Harry Stultiens from Vinarco International. 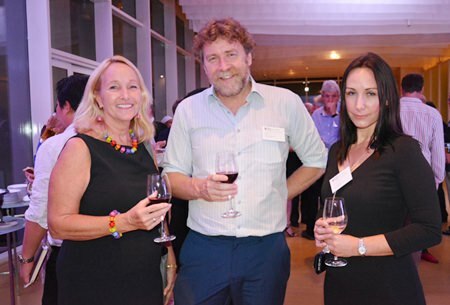 Rosanne Diamente from WWM poses for a photo with Regents International School Pattaya’s Principal Iain Blaikie, and School Bursar Kirsty Paiboontanasin. 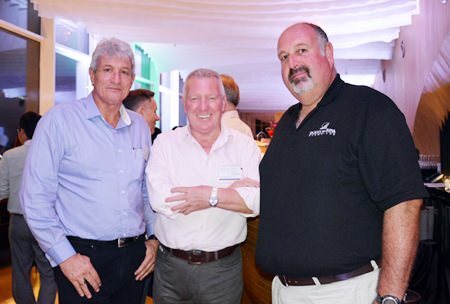 (L to R) Leigh Scott Kemmis, President of the AustCham, Brian Chapman, Associate Wealth Consultant Devere Group Thailand and Scott Finsten, Harbor Master of the Ocean Marina Yacht Club. 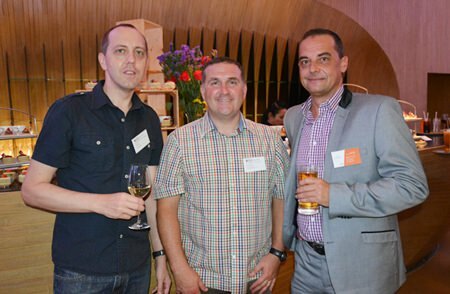 (L to R) Gary Russell, Paul McConnell from Regents International School and Keith Ellis, Sales Director of Atalian Global Services.